Growing up, we’d occasionally get new dinner ideas served to us, but for the most part our monthly meal plan involved rotating the same 15ish dinners around or to some small varying degree shakin’ them up a little. 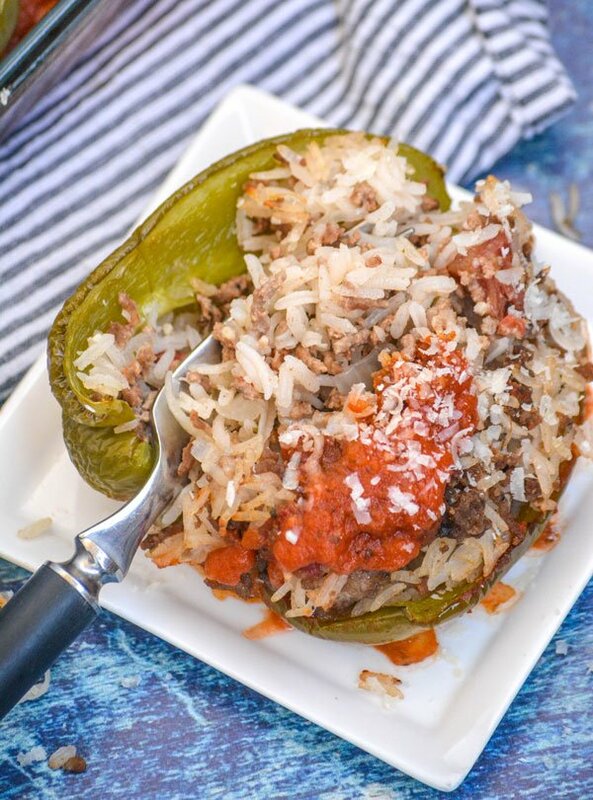 The classic American version of stuffed peppers were one of our favorite recurring meals. They were your typical standard fare, a meal gracing tables all across the country growing up. It was your pretty standard stuff, a seasoned mixture of ground beef and rice, tossed together and stuffed into a tangy green bell halves. Topped with sauce and a bit of cheese, they were baked in a tomato sauce filled dish and served hot. Naturally, we had to eat the roasted peppers, but the filling was still always my favorite part. Fast forward to today, and I’ve since learned that many, many countries around the world have their own ‘classic’ version of this common dinner. Spain has it’s own version cooked in either bell peppers, or pablanos, with a mixture of arborio rice, saffron, and cooked in a traditional tomato based sauce. India stuffs there’s with spicy, seasoned potatoes. Yum! Hungary makes a version with a similar combination of beef, rice, cooked in a tomato based sauce, but with their traditional spices and serve them with sour cream. Even the Asian market knows the value of a great stuffed pepper recipe. Although their unique spin features a stuffing of shrimp, pork, and water chestnuts. 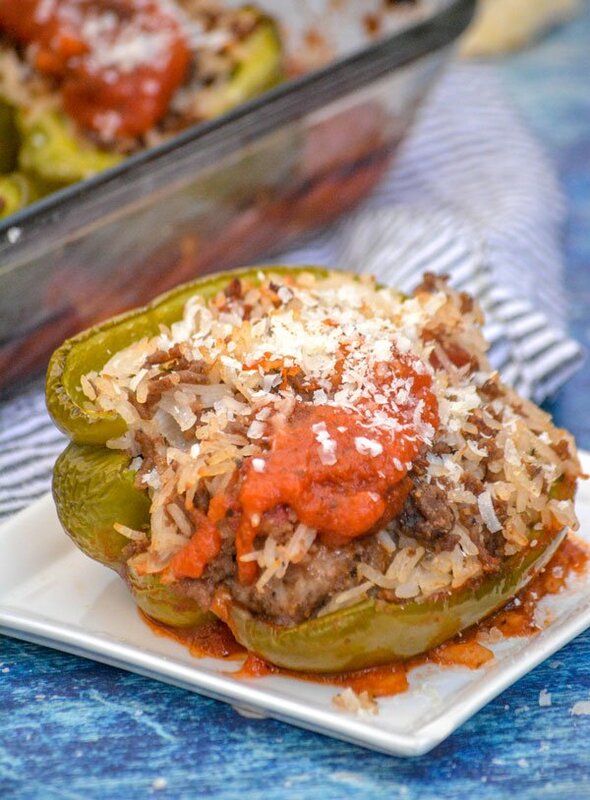 Who knew stuffed peppers were literally a dish common across the whole world?! Shoot, I didn’t even know bell peppers were that common across the pond on the continent. It was also probably appropriate that I learned today, Columbus Day in the States, that the common name for them actually came from the controversial Italian himself. During his misadventures in South America, he came across the unripened vegetable. Yes, that’s also true- they’re like any other fruit and ripen- hello, sweet red peppers. The green variety is equally delicious, but not the ripened way the plants want you to enjoy them. So, Columbus took vast quantities of the new vegetables back with them, and couldn’t help constantly remarking on their church bell-like shape. The name stuck, and it’s still sticking around almost 400 years later. Years later, I was married and my world was rocked when my Grandmother passed suddenly from stage 4 cancer. My MIL, being thoughtful and sweet, brought us a meal of homemade stuffed peppers when our youngest was about 2 months old, trying to channel a little bit of my Grandma’s memories. They were good, too. Not the same though. I’ve gotta admit, they were different in the most delicious way. Guess that’s what an Italian-spin on an Americanized classic will do. 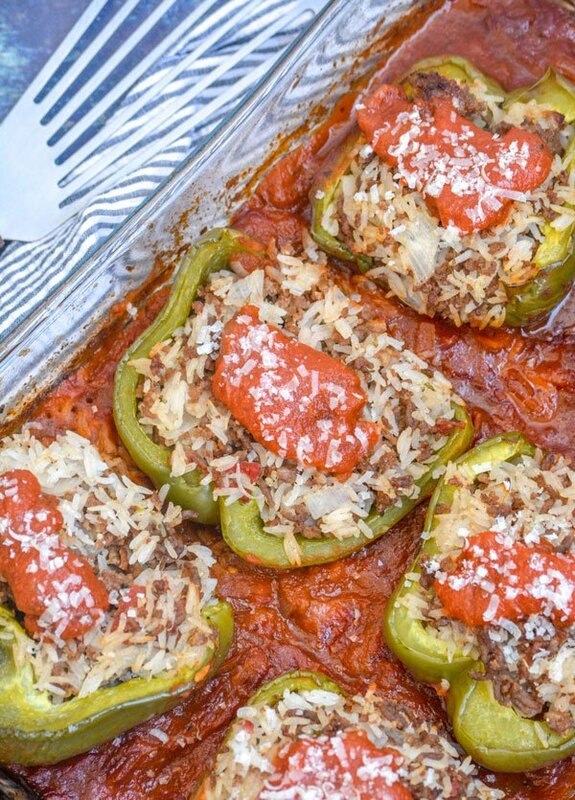 Either way, (and as much as I love my Grandma) The Best Saucy Italian-Style Stuffed Peppers will forever be the one’s rotating on our family menu from now on. Luckily, they still make me think of her and our many afternoons in the kitchen anytime I mix up a batch. A mixture of cooked ground beef and ground Italian sausage are seasoned with an Italian blend of spices, garlic, and onion. Stirred with steamed long grain white rice, chopped Italian parsley, and shredded Parmesan- the mixture’s stuffed into halved, seeded green peppers. The peppers are roasted in a bed of savory marinara sauce, and served hot- ready to be devoured. 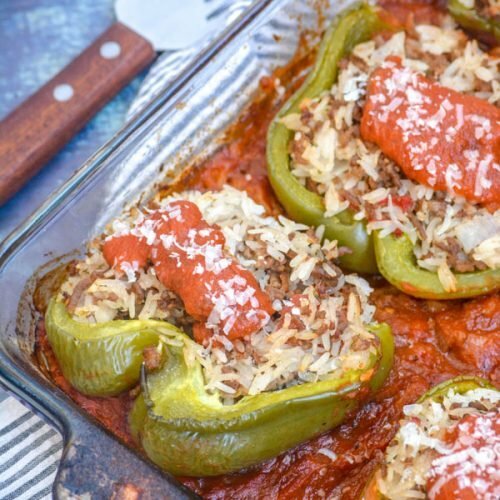 Whether you’ve got an Italian bone in your body or not, The Best Saucy Italian-Style Stuffed Peppers are waiting to become your new family favorite meal too. 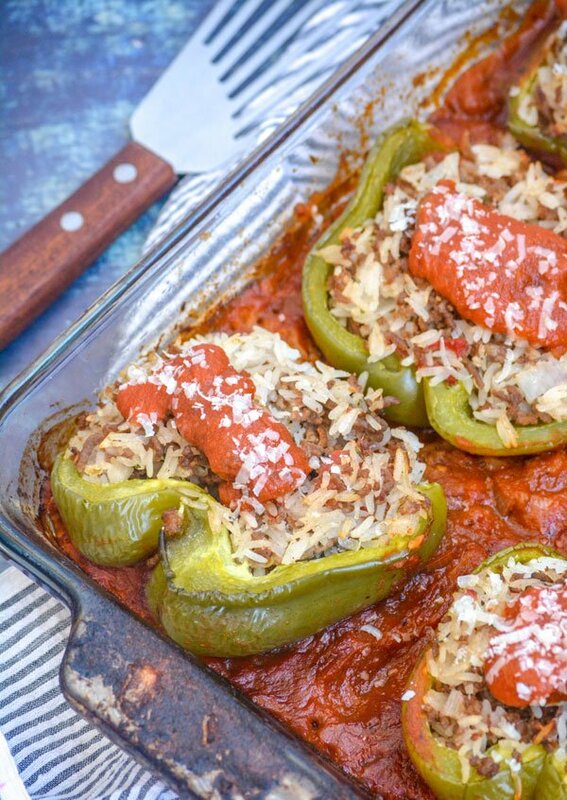 This recipe features ground beef & sausage, with a healthy heaping of Parmesan cheese, for an Italian version of the classic stuffed peeper dinner. In a large skillet, cook the onion and olive oil over medium heat until softened. Add in the sauce, broth, vinegar, and red pepper flakes, stirring to combine, and cooking for an additional minute. Transfer the sauce mixture to the bottom of a 9x13" baking dish. Use a spoon to spread out evenly. To a large mixing bowl, add the beef, sausage, tomatoes, parsley, garlic, salt, black pepper, and use your hands to really mix everything together well. Stir in the rice and cheese. Stuff the peppers with the meat & rice mixture. 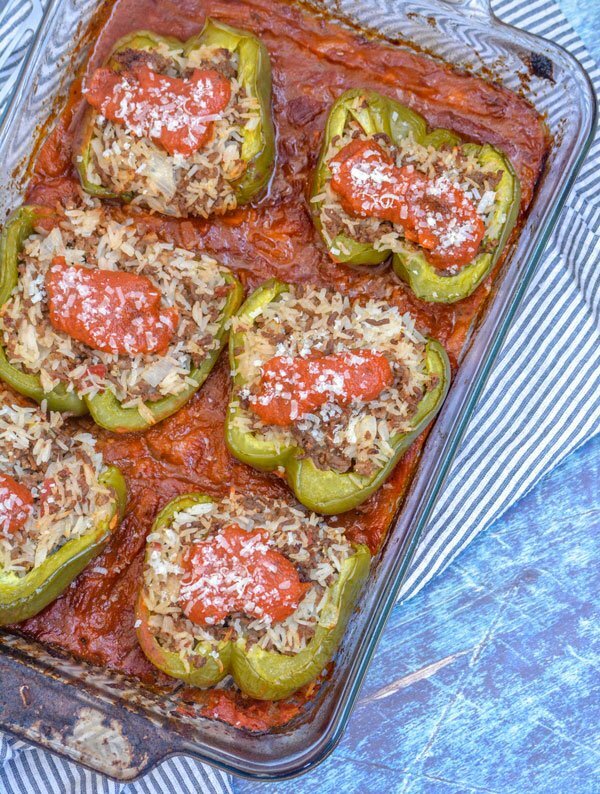 Place stuffed green bell pepper halves in the baking dish over tomato sauce; sprinkle with additional cheese, cover baking dish with aluminum foil, and bake at 375 degrees for 45 minutes. Remove the foil and return the dish to the oven, baking adn additional 20-25 minutes.